Pomperaug's Alaina Karp competes in the floor exercise during the SWC girls high school gymnastics championships at New Milford High School, New Milford, Conn, Thursday, February 7, 2019. 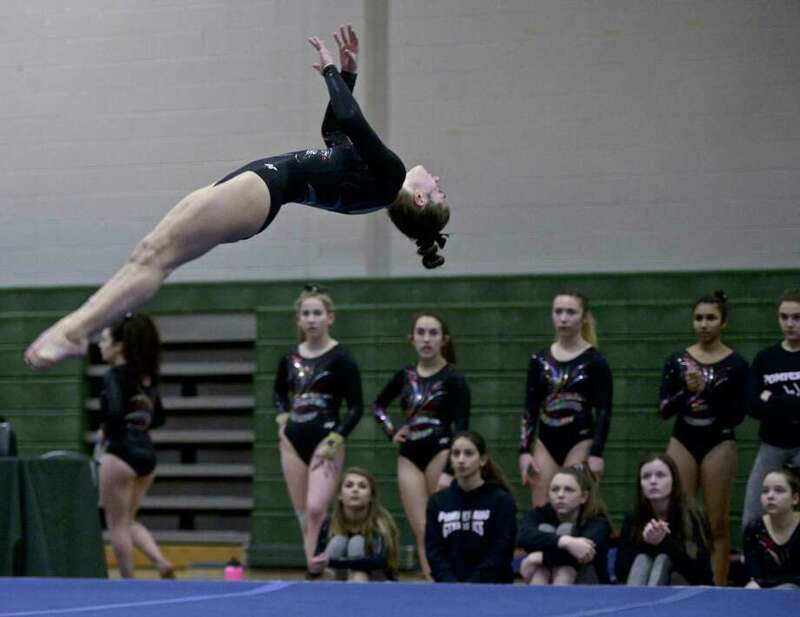 NEW MILFORD — The third time was the charm for the Newtown gymnastics team. The Nighthawks had posted runner-up finishes the past two seasons at the South-West Conference girls gymnastics championship. They decided enough was enough Thursday night at New Milford High School. Everyone put their best foot forward and Newtown took the championship plaque home. Newtown posted a winning score of 132.900 points to hold off determined runner-up Oxford (130.800). Host New Milford (126.750) was third followed by Pomperaug (125.950) and Nonnewaug (123.350). Leading the way for Newtown was Hannah Jojo. The junior captured the gold medal in vaulting (8.65), and uneven bars (9.0) on her way to taking the all-around title (34.75). It all added up to a plaque for Jojo as Championship MVP. Oxford High freshman Anna Gramlich scored 8.8 to become the SWC champ on balance beam. Pomperaug High sophomore Alaina Karp won the floor exercise with a score of 9.2. Karp was runnerup on all-around (34.65) while Gramlich was fourth (33.50). Oxford made the team race close despite missing injured senior Emily Baktis. Nicole Bobbie and senior Taren Diaz had big nights to support Gramlich’s efforts. New Milford didn’t get its third title in four years. But the Green Wave showed they are ready for the upcoming state championships. Team Scores: 1, Newtown 132.9; 2, Oxford 130.8; 3, New Milford 126.750; 4, Pomperaug 125.950; 5, Nonnewaug 123.350; 6, Joel Barlow 83.3. Vault: (Top 3 medalists): 1, Hannah Jojo (Newtown) 8.650 points; 2, (tie) Marisa Choi (Newtown), Alaina Karp (Pomperaug), Paige Brandt (Nonnewaug) 8.60; 3, Allyson Kenny (Newtown), 8.55. Uneven Bars: 1, Hannah Jojo (Newtown) 9.0; 2, Thea Spinner (New Milford) 8.7; 3, Allyson Kenny (Newtown) 8.50. Beam: 1, Anna Gramlich (Oxford) 8.80; 2, Anna Santerelli (New Milford) 8.6; 3, 3, Alaina Karp (Pomperaug) 8.45. Floor Exercise: 1, Alaina Karp (Pomperaug) 9.2; 2, Taren Diaz (Oxford) 8.90; 3, Hannah Jojo (Newtown) 8.70. All-Around: 1, Hannah Jojo (Newtown) 34.75 points; 2, Alaina Karp (Pomperaug) 34.65; 3, Allyson Kenny (Newtown) 33.85.